According to the printed histories no trained nurses were employed at the Royal Free Hospital (RFH) before 1870, however, according to the earliest Register of Nurses, Jane Dunwoody, who had trained at St Georges, was appointed as a Head Nurse 1868. In 1870 the Royal Free Hospital made an agreement with the British Nursing Association (BNA), who supplied a Superintendent and 18 nurses at the cost of £276 a year. 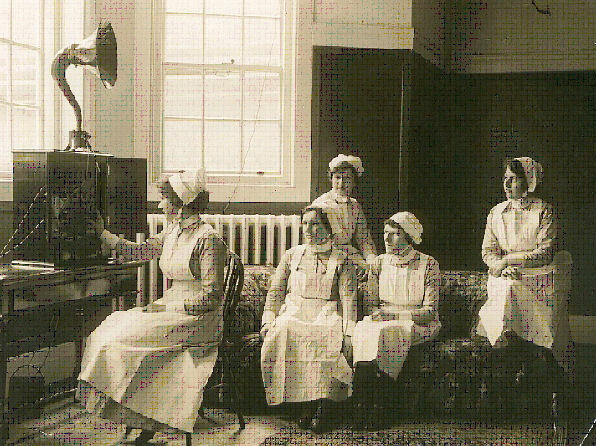 The BNA trained its staff on the wards, and when the Association was dissolved in 1884 the hospital was left without any form of training, although most of the nurses stayed on. In 1887 a Trained Nurses Institute was established at the Royal Free by the Matron, Eugenie Barton. During 1888-1889 Miss Barton set up a training programme, and the first Probationers and Lady Probationers commenced training. Probationers were aged between 23-35 years and served a 3 year training, after which they received the Hospital Certificate; they then served a 4th year as a Staff Nurse. They were provided with free board, lodging, uniform and laundry. Lady or Special Probationers were of a higher educational standard. Their training was not less than six months. They were required to pay for their training, and also their uniform and laundry. From 1891 until the dissolution of the School the Cordwainers' Company made an annual award of a gold medal to the outstanding Student Nurse at the RFH. Latterly Silver and Bronze medals were also awarded. The Master of the Company always attended the school's annual prize-giving. In 1925 the Alfred Langton Home for nurses opened in Cubitt Street, initially accommodating 65 nurses and 25 maids. The home was extended in 1932 and renamed the Langton-Riddell Nurses Home. In 1936 a Preliminary Training School was established in the basement of the Nurses Home. After the establishment of the National Health Service in 1948 the Royal Free Hospital School of Nursing (RFHSN) received an annual Treasury grant. Classrooms and equipment were improved, and a library was opened. A Nurses Education Committee was established in 1949. In 1961 the school moved to the former Belmont Hotel in Highbury Park, and in 1968 to 21 Pond Street, Hampstead, on the site of the 'new' Royal Free. Male nurses were admitted in 1974. In 1990 the RFHSN ceased to exist in its own right. The School was absorbed into the North London College of Health Studies, along with the nursing schools of the Whittington, North Middlesex and Chase Farm Hospitals. The College in turn became the Faculty of Health of Middlesex University in 1995.